4. With his six medals in London, Phelps would rank 13th in the overall medal count, tied with Netherlands, Ukraine and 2016 host country Brazil. 6. Phelps has as many medals as India (population: 1.24 billion). But that's low-hanging fruit. India isn't a country associated with athletics that don't involve wooden sticks. Argentina has produced famous soccer players (Maradona), Grand Slam tennis champions (Gabriela Sabatini, Juan Martin Del Potro) and NBA stars (Manu Ginobli), and has one less Olympic gold in its 112-year Olympic history. 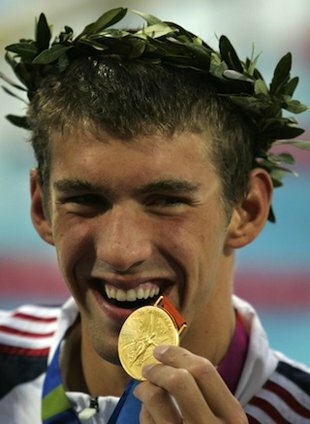 Michael Phelps with his First Gold Medal in Athens. 7. Per capita, the Indian nation has won a medal for every .000000545455 citizens. Phelps has 22 medals for one. 14. Phelps has more gold medals in London than Spain has total medals. 20. Phelps won 22 medals in 24 Olympic finals. The only two events in which he failed to medal: the 200 fly in 2000 and the 400 IM last Sunday night in London. Overall, he swam 24 events, 51 races and 9,900 meters overall in Olympic competition.